Every now and again my sister in law and I get together and rent an indoor arena. 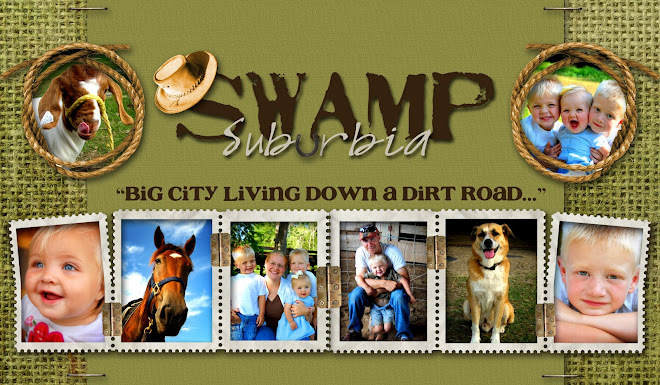 We pack up the horses and kids and head over for a night of pizza, dirt, and riding. We love it. We are able to get the horses away from home and into a different area. The other night we had a great time. We only brought three horses. My sister in law brought four horses. While we were there, I got Mr. Cowboy to ride Ozzie. I have not been able to work Ozzie for about five weeks. We brought him to ride for a little bit and to see how he would do. 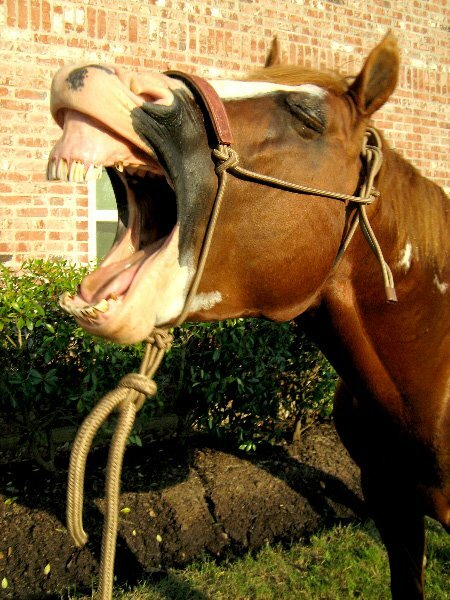 Normally a three year gelding that has not been ridden in that long of a time would have been wild and crazy. Mr. Cowboy got on and I was so impressed. I really didn't get to watch because I was getting two other horses ready. But what I saw of them riding was great. Here is one picture I took. Nice and clear, right? Not really. 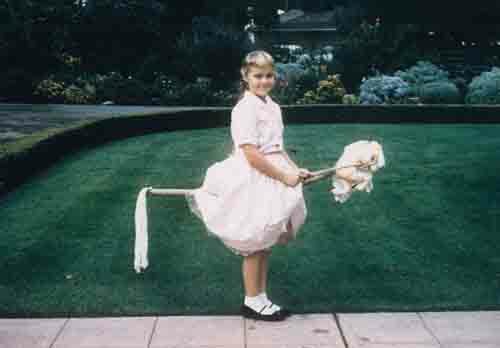 But man, look at that fetlock drop!!! That is amazing! Just so you all know, Ozzie is really smooth to ride. 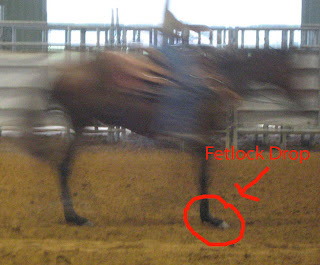 The more the fetlock drops the smoother the ride. But with that, there are also risks of pulling tendons. I just have to watch him to make sure he doesn't strain those tendons in his legs. But as you all know he doesn't get ridden that much so not too much strain. Hopefully I will be able to ride more this summer and get him really going great. After the ride Mr. Cowboy sat on him for a while to see how long he would stand still. Here they are just chillen. You can see here how narrow and Thoroughbred like he is. He gets that from his mother. But he really is the neatest boy I have ever had. I also have taught him a few tricks. One of my favorites is when I am on his back I will just touch my heals to his sides and Ozzie will drop his head. I asked Mr. Cowboy to do it and this is what Ozzie then looked like. He is such a good boy! I really do not know how I lucked out with this one. As you can see Mr. Cowboy is not really paying any attention to me. What I also love about Ozzie is that he will be this good for anyone. I had my brother in law get on him and Ozzie did everything perfectly for him. Now, Ozzie had been standing there for a while and I wanted to see Mr. Cowboy ride him again. So, I begged and pleaded for him to ride Ozzie so I could video them. Poor Ozzie thought he was finished. So, as you watch this video you will notice a few things. First, Mr. Cowboy is posting on the wrong diagonal. I have tried for 5 years now to get him to post on the proper diagonal but he just won't listen. I guess it's a guy pride thing. He does fix it about half way through. The second thing you will notice is that when asked to canter/lope/run Ozzie is a bit lazy and doesn't seem at all interested in going any faster than a trot. Third thing is when loping Ozzie starts to drop his shoulder and tries to run into me. Fourth thing is Ozzie makes two very sad attempts at crow hopping. Mr. Cowboy did not believe me, but I could see Ozzie try it twice. I really think Ozzie thought he was finished. Then right at the end Buttercup entered the arena. You can see where Ozzie went. He then really dropped his shoulder and refused to turn. He just wanted his girlfriend. So, watch and enjoy. This is Ozzie with Mr. Cowboy riding him. I think it's about ride number 13 for them. I have ridden Ozzie 3 times. So, Ozzie has been ridden a total of 16 times. Here goes. I personally think that Mr. 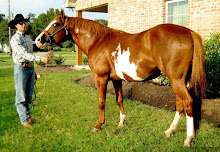 Cowboy could slap an English saddle on Ozzie and then get himself some breeches and a hunt coat and could do well in an open equitation class. 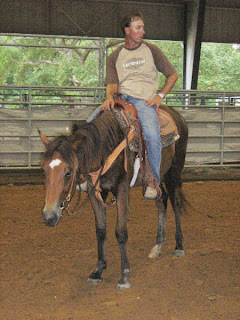 For a cowboy that never had any riding lessons he sure has great posture. And he has soft hands too. I don't know if you saw him lightly lift up on the reins and Ozzie put his head down a bit. Mr. 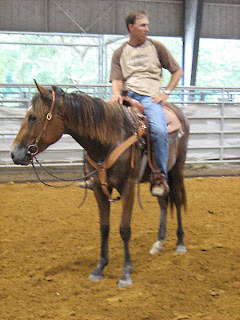 Cowboy does a good job putting up with me telling how to "ride". I did get after him for not counter bending when Ozzie dropped his shoulder, but that wasn't on the video!! We had a great night! I think Ozzie is coming along nice and slow. That is cool that you guys get to rent an arena and have fun. Looks like you had a fantastic time and Ozzie is super cute!! It would be awesome to have an arena all to yourself to have fun in. What a great time for you guys! The arena-renting sounds like fun! We should haul out to ride more in the winter around here....just to stay out of the rain! 16 rides! Ozzie is doing darn good! I was thinking of Mr's soft looking hands as he was riding. Wonderful posture, too. Good job teaching him.